Sow in the spring, harvest in fall. Or sometime in between. It’s axiomatic. A basic most in the Northeast live by. But not Jim and Dorothy Oswald. They planted a kitchen garden in the yard of their son’s Conshohocken row house on Aug. 15. By September, they were picking salad greens. By October, they were harvesting vegetables. And they expect to be eating from that garden at least through December, and quite likely through the winter. Since taking early retirement from teaching, Jim and Dorothy have dedicated themselves to a vegan lifestyle. 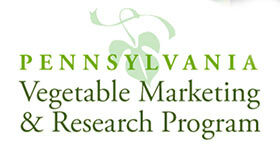 To that end, they founded and operate the nonprofit Institute for Plant Based Nutrition. And they took on the challenge of a town garden as a way to encourage others to make more productive – and year round – use of the land. Or, for that matter, of any spot in the sun where a container garden might flourish. 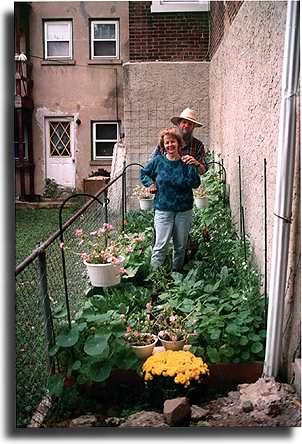 Their Conshohocken plot is just 5 feet by 20 feet sandwiched between the wall and a fence, but it’s enough to supply a family of four. And up until they tackled the mean weeds in August, the site was a patch of cinders, broken bottles and sadly lacking soil, with nary a sign of life but ants and slugs. “Kitchen gardens are a Philadelphia and a Pennsylvania tradition,” said Jim Oswald, who sees the recent resurgence of community gardens as a good sign.